I mean, how many 9-year-old girls are obsessed with pi? And since I’m studying math myself right now it seemed somehow appropriate. Blueberries are sweet enough that lowering the sugar content doesn’t alter the outcome of this pie very much. Of course, now you can also call it, “breakfast” or “health pie”. Health pie. I like it. For a low sugar version, your berries have to be ripe and taste good. So taste them before you start this pie. If you need, you can increase the sugar up to 3/4 cup for sweetness if your berries aren’t ideal. 1. Place the oven shelf on the lower 3rd of the oven and preheat to 425 degrees. Line the bottom of a 9” pie dish with dough and brush with egg white mixed with a teaspoon of water. 2. In a small bowl, mix together sugar, flour and salt. Set aside. 3. In a large bowl gently toss together blueberries, vanilla extract, almond extract, and Cointreau. Add flour mixture and gently toss to coat. Pour blueberries into the pie pan and spread out evenly. 4. Dot the fruit with butter and cover with another pie dough. Trim and flute edges. Brush top lightly with egg and sprinkle with sugar. 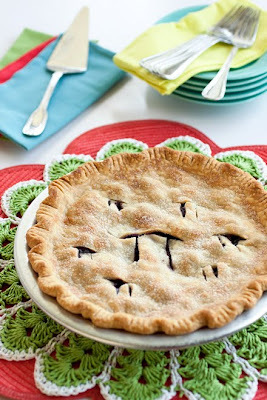 Cut vents into pie in the shape of pi if you like. 5. Bake for 50 minutes, placing a pie shield on after about 10 minutes. Remove from oven when crust is golden brown and filling is bubbly. Very fitting indeed to have a pi in the pie.. :) Seems like forever since I last did anything math related! Your pie looks delicious though, with or without the pi. I like the sound of health pie. :) Low sugar is a great idea. I'll save this recipe for summer when the blueberries are at their sweetest! Classic. I love the dialogue between you two. Blueberry pie is hard for me. It never thickens correctly. I'll try your version next time. I love pi pies! This sounds delicious! Love it! How incredibly cute is that!? Okay, now I'm ready to go blueberry picking. This pie is low on sugar so that I can eat it with abandon:) Clara is one smart cookie! I had NO CLUE what pi was when I was 9! Hi Laura. Oh I love the thought of this pie for breakfast. What a great treat from one of my favorite bloggers. You always inspire me with your beautiful AND healthy eats. I hope you have a wonderful end to your week. Stay safe and happy. Love from Austin.